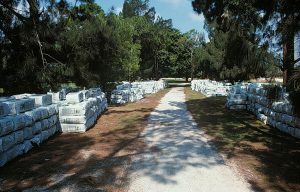 Bales of Canadian sphagnum peat moss ready to amend golf course greens, Tequesta Country Club, Bill Wagner, Superintendent, early 1980s. Organic matter content of rootzone mixes by weight or volume is an overlooked problem in specifying golf course greens and sports turf field construction. A sand:peat mix that was specified as 80:20 by volume was analyzed as only 0.66% OM, measured by weight. An organic matter weight and volume converter was written to help solve soil mix problems. This is in conjunction with a longer article explaining the value of OM in sand rootzones and the variability of bulk density and OM content of organic sources for soil amendment. Sand rootzone mixes for golfcourse greens and sports turf fields should be amended with about 15% fibrous peat, e.g., Canadian sphagnum peat moss or reed-sedge peat, by volume. This increases water and nutrient holding capacity, increases capillary porosity, and increases stability. Organic matter content, which is analyzed based on weight, of rootzone mixes should be at least 1.0%, and preferably 1.5% or 2.0%. The consequences of OM addition are difficult to predict depending on sand particle size and organic source. However, the benefits of Canadian sphagnum peat moss are that it is relatively predictable and stable over time and there is a growing body of research supporting it. Reed-sedge peat has also been investigated and is locally available in Florida. More well-decomposed organic sources including muck are less predictable and may harm in saturated hydraulic conductivity and soil porosity. My recommendations are that in specifying soil mixtures, whether in purchases and sales or in experiments, the organic matter content by weight should be indicated along with the volume mixture and the type of organic matter used. The USGA Recommendations for Putting Green Construction are to have 1% – 5% (ideally 2% – 4%) OM by weight. For example, at a minimum, a sphagnum or reed-sedge peat would be specified as to the organic matter content, at least 85%, and its bulk density would be reported at the time of blending, along with its fiber content, along with the characteristics of the sand source before blending, including organic matter content and bulk density.